I really wanted to participate in the Christmas Cookie challenge, but I can’t put my finger on a particular sweet that our family makes every year. Except for my mom’s pecan tarts, but all I can recall of those is HUNDREDS of them being made at a time, for teachers, friends, anyone who actually liked them. The only good part was the brown sugar/egg filling, and I ate that raw (hello Salmonella!). For the past few years, Christmas has mainly consisted of me, my husband, and our furballs – Papillons Bailey (10) and Murphie (4). So, as any good mom does for their kids, this year I decided to make treats for them. Every dog biscuit is more or less the same (no sugar or butter like sweets for their upright companions) – oats, peanut butter, flour, maybe a little mint for bad breath... I found a MILLION recipes. But since I've become a regular user of King Arthur Flour in the last year or so, I decided to give their recipe a try. When it came down to it, these cookies were a hit. I have 2 finicky dogs and they scarfed these right up. We also bagged some up and gave them as gifts to my coworkers’ “children”. 1: Preheat the oven to 300 degrees, and line baking sheets with parchment paper. 3: Add eggs and peanut butter. 4: Add water and stir; dough should be cohesive yet a little crumbly. 5: On a floured surface, roll the dough out to 1/4” thick. With a cookie cutter (I used bones and snowflakes), cut the dough and place cookies on parchment lined baking sheets. Scoop up and re-roll the dough make additional cookies. Place the oven rack in the lower third of the oven. Preheat the oven to 400º/375º convection. Line a half sheet pan with parchment. Place the wet ingredients in a mixing bowl. Mix together to blend, they do not need to be well combined. Add the dry ingredients and combine well. Roll out the dough to about 1/2-inch thickness and cut with a biscuit cutter. (Note: "people" cookies are a cute idea but the arms and legs get too well done.) Place the cookies on the baking sheet about 1-2 inches apart (they don't swell much). Bake the cookies for about 20 minutes or until nicely set -- they don't brown much. Turn off the oven and leave the biscuits in the turned off oven to cool. They will become crunchy. Depending on the size of the cutter used, this recipe can yield from 1 to 3 dozen cookies. For training treats: Cut with a very small circular cutter. It’s assumed that during training, multiple treats will be used. 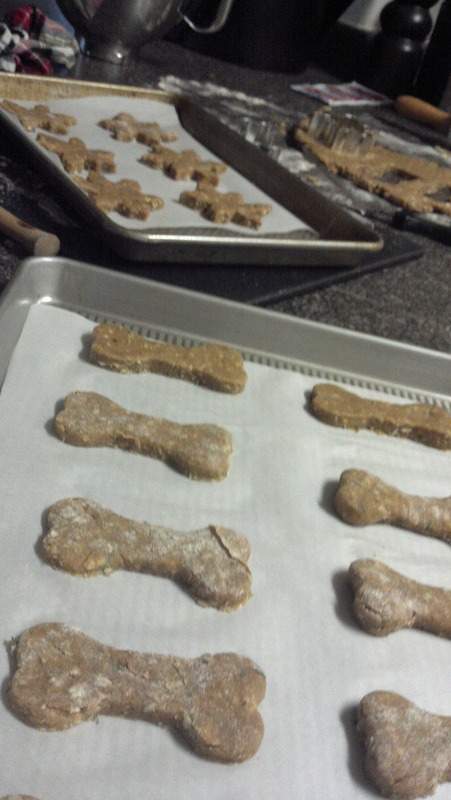 Also, I'd only make the bone shaped cookies for a large dog. These cookies are rich with peanut butter so not too many at a time!